For acclaimed novelist and rosh yeshiva Rabbi Haim Sabato, the world of Torah literature offers an encounter with a rich culture, inspiration, and ideas. In Rest for the Dove, Rabbi Sabato examines each Torah portion, deftly interweaving colorful threads of thought into beautifully-crafted essays. Combining the sensitivity of a creative writer with the insight and deep roots of a rabbinic sage, Rabbi Sabato picks up on themes of the human condition as seen through the Torah narratives. 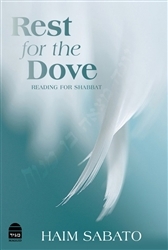 Artfully translated from Hebrew, Rest for the Dove creates a stunning tapestry that will revitalize one’s appreciation for sophisticated Torah scholarship.